What Pressure Should My Boiler Be? Our 5-minute Guide. Boilers lockout when they lose too much pressure, and even when the operating pressure is too high. The question is, what pressure should your boiler be? This quick guide will explain what pressure your boiler should be when it’s hot, cold, optimal working pressures, and how to spot a problem. It doesn’t matter whether you have a Worcester, Vaillant, Baxi or other brand of boiler, operating pressures are all very similar. If you’re looking for a professional to help, you can book one in here. Or, if you’re tired on your old and unreliable boiler, you can get fixed prices on-screen using this form. What Pressure Should My Boiler Be When It’s Cold? 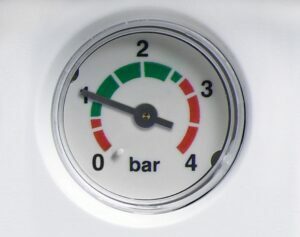 The pressure on a boiler should be between 1, to 1.5 bar. Most manufacturers recommend an optimal working pressure of 1.3 bar . Always refer to your owner’s manual. Different manufacturers will recommend different optimal operating pressures. Should A Boiler Increase In Pressure As It Heats Up? The answer is yes. You can check this by looking at the pressure gauge. This is usually located on the boiler display panel (or on some older boilers, such as Ferrolis, it’s located just below the boiler casing). What Pressure Should My Boiler Be When It’s Hot? Generally, a boiler’s pressure won’t rise by more than 0.3-0.5 bar. So, it should be no more than 1.5-1.8 bar. Why Does The Pressure Increase On My Boiler When The Heating Is On? The pressure on your boiler’s gauge will increase when the heating is running. The build-up of pressure is caused by water expansion. This is natural as the boiler heats up water throughout the pipes, radiators and towel rails. But, your boiler shouldn’t rise more than 1 bar during its heating cycle. If your boiler heats up more than 1 bar (or close to 1 bar) during start up, there’s a good chance there’s a fault with the expansion vessel or pressure release valve. If your boiler pressure is too low, sometimes a boiler will lockout and need to be reset. You can top up the pressure by adding water to the system. This can be done via the external filling loop. This isn’t normal, and it’s a sign of a leak. You can figure out why your boiler is losing pressure and leaking here. So, your boiler’s pressure is too high, what do you do? There’s a good chance you’ve recently topped up the pressure, and too much. If you have, you can bleed water from the system via the towel rails as a quick-fix. You’ll need a radiator bleed key, a bucket or tub, and some towels. Insert the bleed key and open the valve slowly until it starts dribbling water. Close the bleed valve using the key and check the pressure. Repeat until you get to optimal pressure. If you drain too much pressure from the system, you can top it up by using the filling loop to add more water to the system. Having problems with your boiler and need them repaired? You can do that here. 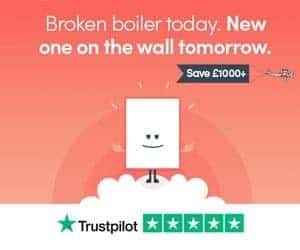 Or, want a quote on a new boiler installation? Head to this form here. And, we’re happy to help where we can. If you have any questions, comment below, and we’ll reply as soon as we can.